The financial collapse of Fannie Mae and Freddie Mac in 2008 led to one of the most sweeping government interventions in private financial markets in history. The bailout has already cost American taxpayers close to $150 billion, and substantially more will be needed. The U.S. economy--and by extension, the global financial system--has a lot riding on Fannie and Freddie. They cannot fail, yet that is precisely what these mortgage giants are guaranteed to do. How can we limit the damage to our economy, and avoid making the same mistakes in the future? 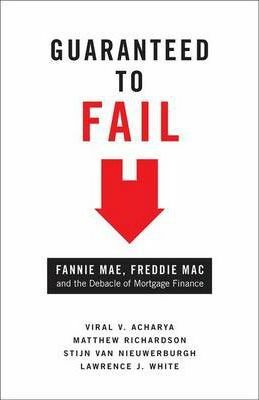 Guaranteed to Fail explains how poorly designed government guarantees for Fannie Mae and Freddie Mac led to the debacle of mortgage finance in the United States, weighs different reform proposals, and provides sensible, practical recommendations. Despite repeated calls for tougher action, Washington has expanded the scope of its guarantees to Fannie and Freddie, fueling more and more housing and mortgages all across the economy--and putting all of us at risk. This book unravels the dizzyingly immense, highly interconnected businesses of Fannie and Freddie. It proposes a unique model of reform that emphasizes public-private partnership, one that can serve as a blueprint for better organizing and managing government-sponsored enterprises like Fannie Mae and Freddie Mac. In doing so, Guaranteed to Fail strikes a cautionary note about excessive government intervention in markets. Viral V. Acharya, Matthew Richardson, Stijn Van Nieuwerburgh, and Lawrence J. White are professors at the Leonard N. Stern School of Business at New York University, and are experts in applied financial economics. Acharya and Richardson are the coeditors of "Restoring Financial Stability" and "Regulating Wall Street". Van Nieuwerburgh is an expert on household finance and mortgage markets. White has studied government-sponsored enterprises for many years and served on the board of Freddie Mac from 1986 to 1989 as part of his government service as a board member on the Federal Home Loan Bank Board.